(Please note that Canada is not one of the countries analyzed by the Global Property Guide). The world’s housing markets moved clearly down during the year to the first quarter of 2012, according to the Global Property Guide’s latest house price indices survey. Residential property prices fell in 24 countries, of the 36 countries for which quarterly house price statistics are available, and rose in only 12 countries. During the latest quarter the downturn appears to have accelerated, with property price falls in 26 countries and price gains in only 10. In nominal terms only 16 countries experienced home price falls during the year, while 20 countries recorded price rises. But the Global Property Guide’s statistical presentation uses price changes after inflation, giving a more realistic picture than the more upbeat nominal figures usually preferred by estate agents. Ireland’s price-declines have been, over the duration of the crisis, catastrophic. It is disheartening to see more agony, yet the picture really is alarming. House prices fell 18.95% year-on-year, contrasting with a decline of ‘only’ 13.12% during the same period last year. Furthermore, house prices were down 5.19% during the latest quarter. Tough credit conditions, an oversupply of housing, and weak domestic demand have weighed down the Irish residential property market. There was also an alarming increase in momentum of house-price declines in Athens, Greece (-11.68%); in Warsaw, Poland (-10.94%); in Portugal (-10.45%); in Spain (-9%); in the Netherlands (-6.05%); and in the Slovak Republic (-5.89%). All saw bigger house-price declines this year than the previous year. Several countries whose housing markets were last year either in recovery or only just in downturn, saw a significant deterioration in their position, with house price falls during the year to end Q1 2012 in Finland (-2.05%), in Turkey (-2.32%), Sweden (-5.34%) and Riga, Latvia (-5.83%). In other European countries, any positive changes in the momentum of the housing markets were so feeble, that they hardly signal a recovery. These countries include Kiev, Ukraine (-2.51%), Croatia (-2.45%), United Kingdom (-3.14%), Lithuania (-3.87%) and Bulgaria (-6.21%). Some strong European markets do relieve the gloom. In Estonia house prices surged by 9.13% year-on-year, and in Austria house prices rose by 8.24% year-on-year. In fact the upsurge in these two countries’ housing markets was so strong as to propel them into third and fourth place in the worldwide league table. Other strong housing markets over the past twelve months include Switzerland (+5.49%), Norway (+5.43%), Russia (+3.86%) and Iceland (+2.25%). The ‘gainers’ seem to be countries whose housing markets either never experienced the recent downturn (Austria, Switzerland, Norway), or are recovering (Estonia, Russia, Iceland). House prices in India (Delhi) and Brazil (Sao Paulo) surged further, but momentum was down during the quarter. Over the year to Q1 2012, Delhi house prices skyrocketed by 24.41%, though during the last quarter, they fell 0.07%. Some other Indian cities like Chennai and Kolkata saw house price falls year-on-year, according to NHB Residex. In Sao Paulo, house prices climbed by 18.70% in the year to Q1 2012, but the latest quarter saw a price-decline of 2.57%. In the Philippines (Makati Central Business District), prime condominium prices rose by 7.34% during the year. But the figures possibly exaggerate the upsurge, because they are for Makati, the heart of the Philippines’ business process outsourcing boom. In South Korea house prices were up 2.67% from a year earlier. Housing markets in the rest of Asia cooled over the year to Q1 2012, due to government measures implemented last year. House prices in Hong Kong were up a mere 0.19% on the year, after a rise of 19.80% the previous year. There were house price falls in Indonesia (-0.13%), Singapore (-1.36%), Tokyo, Japan (-2.64%) and Shanghai, China (-3.68%). US house prices rose modestly to 0.48% year-on-year, with a quarterly rise of 0.55%, according to the Federal Housing Finance Agency’s (FHFA) seasonally adjusted purchase-only house price index. In inflation-adjusted terms, US house prices were still down 2.27% from a year earlier. But this is a significant improvement from last year’s 7.44% decline in house prices. Increased affordability and a somewhat smaller inventory of homes for sale are positively impacting house prices, says FHFA Principal Economist Andrew Leventis. House prices in Israel were down 4.94% year-on-year to Q1 2012. Prices were hit by worldwide uncertainty, plus measures taken by the Israeli government and the Bank of Israel. The fall comes amid popular protests since last summer over high prices, which have not yet waned. House prices in New Zealand climbed by 0.82% over the year to Q1 2012, after falling 4.79% the previous year. Sales activity has been strong for the last few months, with volumes at the highest levels since 2007. Australian house prices fell for the fifth straight quarter to -6.04% from a year earlier, the longest downturn for a decade. The central bank has maintained the highest borrowing costs among major developed nations. RBC says home ownership was less affordable in most major Canadian cities during the first quarter, although Calgary and Edmonton bucked the trend. The latest RBC Economics report on home affordability says its index deteriorated sharply in Vancouver and to a lesser degree in Toronto, Montreal and Ottawa — primarily due to higher real-estate prices. But the bank’s affordability index was unchanged in Calgary and improved in Edmonton compared with the fourth quarter of 2011. The report tracks how much of a home owner’s income would be required to pay typical costs associated with owning a standard one-storey detached house. In Vancouver, RBC estimates the combined cost of mortgage payments, utilities and property taxes rose 3.1 percentage points to 88.9 per cent. In Calgary, by contrast, only about 36.7 per cent of pre-tax income would be required to pay for a standard bungalow — unchanged from the previous study — and in Edmonton the index improved by 0.4 percentage point to 32.4 per cent. In Toronto, the index deteriorated by 1.2 percentage points to 53.4 per cent; in Montreal, the cost of ownership increased 1.2 percentage points to 41.4 per cent of income and in Ottawa it was up 0.9 per cent to 41.8 per cent. “It became a little tougher on household budgets to carry the costs of owning a home at market prices at the start of this year,” said Craig Wright, RBC’s chief economist said in a statement today. He said the challenge will likely increase once the Bank of Canada begins raising interest rates. “Exceptionally low interest rates have been the key force in keeping affordability from hitting dangerous levels in Canada in recent years,” Wright said. He said RBC expects Canada’s central bank will hike rates gradually, starting in the fourth quarter. “A gradual pace of increases will allow income growth to provide some offset,” he said. My real estate column in the Vancouver Sun featured property sales in Kelowna, and Sun Peaks. The big sell: At the same time the B.C. government increased the new housing rebate threshold to $850,000, it introduced the same limit for purchasers of new secondary vacation or recreational homes outside the Greater Vancouver and Capital Regional districts. This means buyers of new homes priced up to $850,000 will be eligible to claim a provincial grant of up to $42,500. This has injected new-found enthusiasm into B.C.’s new recreational properties in areas such as Sun Peaks. This newly built ski in/ski out half duplex comes fully furnished and features a bright open living area with rock-faced fireplace, hardwood floors, granite countertops and stainless-steel Viking appliances. There is a family room, a master suite with walk-in closet and a spa-like ensuite with soaker tub, rain shower and double sinks. There is a large double garage and three private patios. The home can also be rented out on a nightly basis. The big sell: This home was built in 2007 in Kelowna’s Dilworth Mountain neighbourhood. Among its selling features: the unobstructed dramatic views of the Glenmore Valley below. The custom-designed rancher sits on almost a quarter-acre property and has detailed finishings throughout that include granite countertops, hardwood and slate floors, recessed and pendant lighting, stainless-steel appliances and vaulted ceilings. The open-concept floor plan has two bedrooms on the main floor — including the master with full ensuite bathroom — alongside the living room and kitchen. The basement has two further bedrooms, a spacious family room, a den area and an additional bathroom. There is an extensive bank of floor-to-ceiling windows and a large balcony to maximize the panoramic vistas. The landscaped garden contains an underground sprinkler system and a covered patio area that provides shade. For the full story, please click on Real estate sales in Sun Peaks and Kelowna. Compiled by Nicola Way of BestHomesBC.com and AssignmentsCanada.ca. Yesterday, Bob Rennie of Rennie Marketing Systems gave his annual key note speaker address to the members of Vancouver’s Urban Development Institute – a non-profit association of the development industry with over 600 corporate members involved in all facets of land development and planning including: developers, property managers, financial lenders, lawyers, engineers, planners, architects, appraisers, real estate professionals, local governments and government agencies. The theme of Mr Rennie’s talk was the ever-present spectre of a looming real estate bubble in our city. A specialist in marketing pre-sale condos, he denied that there is a bubble. That’s Vancouver condo marketing guru Bob Rennie’s take on concerns that the region’s real estate market is headed for a meltdown because of sky-high prices. “It’s not a bubble,” said Rennie, director of Rennie Marketing Systems, in an interview following his keynote address to the Urban Development Institute Thursday. Rennie, who spoke to a full house about the state of the Vancouver property market, said aging baby boomers with billions of dollars in equity will become a much greater force in the condo market as they increasingly downsize from expensive single-detached homes, and put money aside for their children. He also noted that the number of people between 55 and 64 will increase 38 per cent between 2009 and 2018, those between 65 and 74 will increase 56 per cent, while those between 35 and 54 will only increase by 4.6 per cent. Because of that, he said, developers should shift their thinking into providing more larger one-bedroom condos to accommodate the downsizing boomers. Rennie said there were about 19,000 condo sales in Metro Vancouver in 2011, and that while the average price for 80 per cent of those condos was $315,000, the overall average price was $427,000, which required an income of $66,000 to finance. Rennie noted that proximity to transit is paramount for today’s homebuyer. He also said that planning should be conducted more on a regional basis in order to make homes more affordable. Meanwhile, Tsur Somerville, director, centre for urban economics and real estate, Sauder School of Business at the University of B.C., said he also doesn’t believe there’s a real estate bubble in Metro Vancouver, largely because there’s not an explosion in housing starts – typical for real estate bubbles. Somerville said that while the affordability numbers have been skewed by the higher end parts of the market – “there were double-digit increases in Richmond, Vancouver, Burnaby and West Vancouver, with single-digit increases everywhere else” — the region is still very expensive compared to other cities in Canada. “Compared to other cities, that income [$52,800] gets you a house. Here, it gets you a condo. That means we’re expensive, but that’s the reality of what we are. 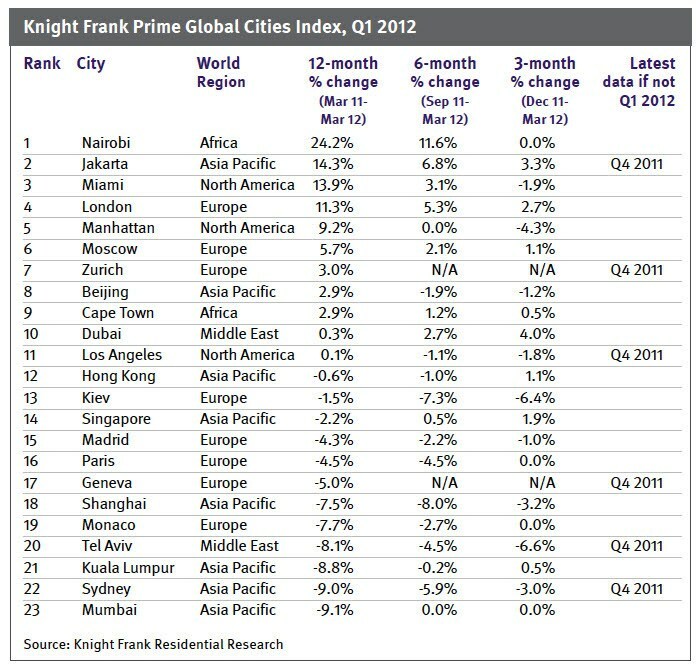 The Knight Frank Prime Global Cities Index recorded its first quarterly fall since 2009, with the average value of prime property in the world’s key cities depreciating by 0.4% in Q1 2012. This represents the index’s first quarterly fall since the depths of the global recession. Although a milestone, the index’s negative quarterly growth is not surprising. Quarterly price growth has been below 2% since Q1 2010 and it averaged only 0.6% in 2011. The first three months of 2012 brought with it little new momentum. The Eurozone’s debt debacle remained at the forefront of the global economic agenda, several critical elections were on the horizon (Russia, France, Greece) and Asia’s highly-effective cooling measures showed no sign of being relaxed. Against this backdrop some luxury buyers took to the side-lines to observe their market’s trajectory. Despite the overall index’s sluggish performance four prime markets achieved double-digit growth over a 12-month period; Nairobi, Jakarta, Miami and London. Perhaps most surprisingly is the fact that the top five performing cities were spread across four continents – North America to be the only continent to appear twice. London and Singapore are proof that there is still a level of resilience in the prime markets with both cities shrugging off the introduction of new stamp duties in the first quarter of 2012. In London both prices and applicant numbers increased despite the stamp duty rise to 7% for individuals buying homes over £2m. In Singapore the new 10% stamp duty for foreign buyers, which was introduced in December 2011, dented demand but not prices according to Nicholas Holt, Knight Frank’s Asia-Pacific research director. In our view the overall index will remain subdued in 2012 fluctuating between marginal price falls and rises (with London, Moscow, Jakarta, Nairobi and Singapore expected to be the strongest performers) but it seems unlikely we are on the cusp of a new deflationary cycle in luxury global house prices. The safe-haven argument still resonates. Capital flight will continue to focus on cities with low political risk, transparent legal systems, good security and ideally those with an HNWI-friendly (High Net Worth Individuals) tax regime. The Prime Global Cities Index tracks the performance of luxury property across a selected number of global cities and is produced quarterly. Waitaminute .. perhaps interest rates aren’t going to rise after all! The Bank of Canada may be thinking about raising interest rates but there’s apparently no need because Canadians are hunkering down to cool debt obligations on their own. “The pace of growth in household credit is no longer a reason for the Bank of Canada to move from the sidelines any time soon,” says Benjamin Tal, deputy chief economist at CIBC World Markets. He wrote a report released Wednesday that suggests central bank intervention is not needed, especially with consumers already seeing interest payments on debt eating into 7.3% of their disposable income as of the fourth quarter of 2011, even at today’s low rates. Toronto-Dominion Bank economist Francis Fong also weighed in, suggesting Canadians have begun to get the message about having too much debt, based on the slowdown in consumer credit growth. Even the chief executive of one of the big five banks joined the discussion, hoping to extinguish some of the panic about Canadian debt. The CIBC report does note that as of March 2012, mortgage debt rose by 6.3% on a year-over-year basis, which is below the average rate of growth seen in the past two years of 7.3%. Overall, Mr. Tal says that for the first time since 2002 consumer credit is rising more slowly than in the United States. “Consumer credit [growth] is basically zero,” he says, adding Canadians have been optimizing their credit situation by taking high-interest credit card debt and transferring it to lines of credit. TD’s Mr. Fong agrees that Canadians are starting to “hunker down” and pay off their debt, but at the same time he suggests a two-percentage-point increase in rates would leave many households at risk. Helmut Pastrick has heard the growing talk from other financial analysts that a real estate bubble or “craze” in Vancouver has left the condo market ripe for a crash. So far, he doesn’t see it. The Central 1 Credit Union chief economist instead says prices aren’t soaring dramatically and he expects continued stability over the short term in the Lower Mainland. Lower Mainland home sales were down in April, but most prices are up modestly from a year ago, although some categories have sagged in recent months. Nor does he see signs that builders are flooding the market with new units. The risk as Pastrick sees it is not from over-inflated prices, but from global events – a new financial crisis in Europe or a war that sends oil prices spiking. He said that could spark a new recession that drags down both real estate and stock markets. “If there’s a global event, Canada will also feel it and the housing market will as well,” he said, adding detached houses would fare better than condos. Over the longer term, Pastrick doesn’t expect Metro Vancouver will suddenly become a more affordable place to own a home. “When I look over the next 25 years, I expect prices will be higher,” he said. The proportion of people who rent instead of own will rise over time, he predicted, and builders will continue the trend of offering smaller units. He also foresees more intergenerational households than in the past with larger extended families living under the same roof. The Real Estate Board of Greater Vancouver’s benchmark price for all residential homes was up 2.8 per cent in the last three months to $683,000 in April, and is up 3.7 per cent from a year ago. Detached house prices have been the strongest, up 6.3 per cent from a year ago, while condos were up just 1.1 per cent. Benchmark prices released by the Fraser Valley Real Estate Board were up 5.3 per cent year-over-year to $576,600 for detached houses in April, although that number was down two per cent from March. Townhouses were up 1.9 per cent from a year ago to $318,400 and condos rose 0.8 per cent to $205,800. The federal government, wary that low interest rates – important for economic recovery – are leading consumers to take on too much debt and inflate home prices, has tightened mortgage lending rules a number of times since the 2009 recession. Metro Vancouver home starts held steady in April and are up 16 per cent from a year ago to nearly 6,000. Total building permits issued in the Lower Mainland were up nine per cent in March from the same period a year ago. That includes industrial and office construction. Realtors say the small boom of sky-high prices for Vancouver Westside houses – one that provoked media around the world to claim with scant proof that mainland Chinese investors were buying up the city – is fizzling out. A house on the 3000 block of West 24th Avenue, first listed at near $4.5-million six months ago, sold on April 15 for $3.35-million. Fresh statistics from the Greater Vancouver Real Estate Board show the number of sales on the Westside is down by nearly 40 per cent for the first four months of the year. Only a third of the nearly 400 homes listed in April have sold – one of the lowest rates in the region. “Banks are now requiring borrowers to disclose incomes and assets before mortgages are approved, as of the last six weeks,” said Westside realtor Marty Pospischil, who specializes in selling single-family homes owned by long-term residents. Last year, he says 90 per cent of his 100 house sales were to “offshore buyers” – people not living here yet, who flew in to buy. This year, it’s less than a tenth of that. “We’re now seeing a 50-per-cent collapse rate in deals, when it’s usually more like 5 per cent,” he said. He and other realtors are saying the Westside slowdown is a good thing because the short-lived boom, which prompted local owners to start listing at increasingly inflated prices, was unrealistic and unhealthy. “I always thought that market was not sustainable. Every local person was juiced out of the market. The average household income on the Westside doesn’t support those prices,” said Andrew Hasman, who specializes in single-family homes on the Westside. Prominent condo marketer Bob Rennie said the high-end house prices in Westside Vancouver were so out of line with the rest of the region and country that it was skewing people’s perceptions of real-estate increases, not just in Metro Vancouver, but in all of Canada. “In 2010, reports were saying real estate went up 8.9 per cent in Canada. But if you took out Vancouver, it only went up 4.3 per cent,” he said. The spike in Westside house prices over the past two years has provoked intense media coverage – with one Bloomberg News story in late May headlined, Chinese Spreading Wealth Make Vancouver Homes Pricier Than NYC – and debate among residents, politicians and commentators both here and abroad. Much of it was attributed to “mainland Chinese” buyers, although no one had hard overall numbers to support that. Nor could anyone say whether that group might be 100 or 1,000 people, or whether they were truly offshore investors or immigrants. But that didn’t stop arguments about the need to limit foreign ownership or to tax speculation to prevent the nebulous phenomenon. A number of realtors said early signs started appearing six months ago that the market was slowing down, but the difference really appeared in early March. There is usually a surge of buying in Vancouver around Chinese New Year, as visitors from China come to see family or friends in the city and often make decisions to buy. This year, the buying spree after Chinese New Year was much smaller, and house sales have slowed in March and April instead of the typical pattern of accelerating into spring. Jean Zhang, with Sutton Group, said her clients, who tend to be immigrants looking to settle here permanently, are waiting longer to make offers. Existing home sales in Canada’s most expensive city dropped in April, according to the Real Estate Board of Greater Vancouver. What we all want to know – just when will interest rates rise in Canada? When will the Bank of Canada raise rates? Bank of Canada governor Mark Carney surprised few with the announcement on April 17 that the overnight lending rate (from which prime rates are derived) would remain unchanged. His comments, however, has begun large changes in rate-hike predictions. BMO has already moved its prediction for the next rate hike from mid-2013 to end of 2012, and many are expected to change their outlook. Swap traders are pricing in a 90-per-cent chance of a rate hike by the end of 2012. 1. Growth will be watched more closely than inflation. Economic growth forecasts have increased from two per cent to 2.4 per cent over the past month, as 82,300 jobs were created in March (a reduction of 0.2 per cent unemployment). Because there is so much money sitting on the side-lines, growth is a good indicator of potential inflation. Inflation was just under the two-per-cent target at 1.9 per cent in March. 2. Carney is now forecasting that Canada’s economy will return to full capacity in the first half of 2013, three to six months earlier than originally forecast. Full capacity is the limit at which the economy can grow without excessive inflation. 3. Global economic factors are improving. Greece’s bailout helped calm down European markets (especially bond markets). Carney predicts a strong second half of 2012 for Europe. The above factors, combined with a constant reminder that consumer debt in Canada is above the comfort zone, may see rates rise more quickly than anticipated. Five-year bond rates (which heavily influence fixed rates) shot up nearly 0.1 per cent after the Bank of Canada announcement, anticipating a quicker recovery than originally forecast. Don’t hit the panic button just yet, though. We have all been through times of positive spring numbers only to be disappointed by the summer, so expect the Bank of Canada to be cautious when evaluating a rate hike. Last spring most banks and economists had predicted the prime rate would be at four per cent by fourth quarter 2011, only to drastically change their outlook by summer and into fall. If the economic momentum carries through the summer and into third quarter, it would be expected that we see a reasonable .25 per cent increase in third or fourth quarter this year. Source: Kyle Green is a mortgage broker with Mortgage Alliance Meridian Mortgage Service Inc.